Grand plans have been outlined for the BRICS emerging market nations as Russia begins its presidency of the group on Wednesday. Transforming the BRICS assembly of Brazil, Russia, India, China and South Africa into "a full-scale mechanism of strategic interaction on key issues of global policy and economics" is a "top priority" for Russia’s presidency, which is expected to culminate at a summit in the Russian city of Ufa in early July, the Russian Foreign Ministry said. There are plans to open new tracks for multilateral industrial cooperation, the ministry said after a meeting on Tuesday. The main goal is to launch the group’s development bank and currency reserve pool as outlined in the Strategy for Economic Cooperation of the BRICS countries established until 2020, it said, referring to the plan proposed by Russia at the BRICS summit in Brazil. The Russian Foreign Ministry’s special envoy, Vadim Lukov, noted that some Western partners had already started to explore the possibility of joining the BRICS New Development Bank, noting that: "This is the first time that such institutions have been created without Western countries’ involvement." Speaking about the tasks of the bank, Lukov pointed out that the new structure would operate on commercial principles. 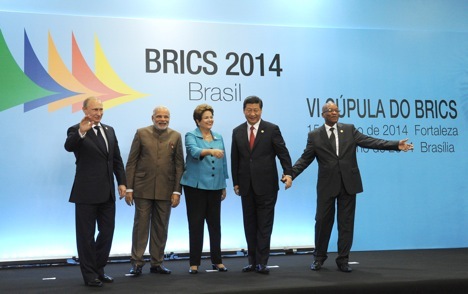 "Shareholders [of the BRICS New Development Bank] believe that all projects should be profitable. This is not a mutual benefit society and not an association providing grants," he said. "The New Development Bank will be based on commercial principles." The head and the board of directors of the new bank are expected to be appointed before the BRICS summit in Ufa, scheduled for July 9-10. A distinguishing feature of Russia’s presidency of BRICS is involvement of civil society groups and young people in the assembly’s work. Moscow will host the BRICS Civil Society Forum in June, while on July 1-5 the inaugural youth forum will open in the Russian city of Kazan. Discussions will focus on youth interaction in culture and economy, alongside prospects for cooperation between young diplomats. Among the most immediate upcoming events during the Russian presidency is the first official meeting of the BRICS countries’ natural resources ministers on April 22 and consultations between deputy foreign ministers in April-May. Georgy Toloraya, executive director of the Russian National Committee on BRICS Research, said the most import thing was to enlist the moral support of the BRICS bloc in terms of opposing unilateral sanctions and double standards against Russia. "In this regard, we enjoy the backing of these countries. We hope that this support will also be declared quite clearly at the summit in Ufa," Toloraya said, adding that it would be much more difficult for Russia to stand alone against the West. The BRICS agenda under the Russian presidency includes plans to strengthen strategic stability and international information security, reinforce the non-proliferation regime, and combat international terrorism. The BRICS countries collectively represent about 26% of the world’s geographic area and are home to 42% of the world’s population. In 2013, the share of the BRICS countries reached 16.1% in global trade, 10.8% in military spending and 40/2% in production of non-renewable energy resources. The BRICS consumer market is the largest in the world and is growing by $500 billion a year.